RUSH: We gotta talk about the Hawkeye straw poll in Ames, Iowa. It was expected that Romney would win. Number two was Huckabee. Now, I mentioned this at the top of the program. It’s a big deal for Huckabee, and I don’t want to trivialize this — the winner or whoever, or runner up or any of that, or Iowa. I don’t want to trivialize this. It’s just so early. It’s six months until the first primary, 15 months ’til the actual election. Three of the four leading candidates didn’t even participate. But the excitement with which the political press is treating this… I think they’re living lives of quiet desperation. They really have one-track, singularly focused lives. By the way, every voter in this thing had to pay. I’m still going to play the audio sound bites from this because it happened out there. I should also mention that most campaigns pay the voters, so that’s why I saw a headline today: ‘Romney Bought His Victory,’ and I’m not trying to put him down. Don’t misunderstand this. Tommy Thompson dropped out of the race. He’s more qualified than any of the Democrat candidates. I’ll tell you what’s really interesting to me about this, and I still have to temper this with the fact that three of the top four weren’t there. You had Romney as the winner. You had Mike Huckabee came in second. What do they both have in common? What do Romney and Huckabee have in common? They’re both governors. They are not senators. Senators do not… It’s a long hall. JFK was the last Senator that got elected president, from the Senate. So anyway, we have a montage to get things rolling here. The Drive-Bys have fallen in love with Huckabee. They’re referring to him now as ‘McCainesque,’ and they’re making a big deal out of his surprise win. GREGORY: Mike Huckabee is a big story. TODD: The Huckabee story is amazing. CARLSON: You usually get what you pay for. Huckabee got more than that. YORK: As far as Huckabee, a really, really big win for him. YEPSEN: Governor Huckabee was arguably the biggest winner. STEPHANOPOULOS: How about Governor Huckabee? BRAZILE: Huckabee, I thought, gave a great speech. DAWSON: Huckabee’s conservative credentials have never been in question. WALLACE: Mike Huckabee was a surprise second. DOUGLASS: He’s been a media darling all along. He’s a straight talking &aacute;la McCain of 2000. This breathes some life into what reporters hope is going to be a story about Mike Huckabee. HUCKABEE: I think yesterday showed that we are getting traction. I’m one of the few Republican candidates that’s having the courage to talk about how we need to really separate ourselves from being the Wall Street Republican Crowd. We need to be the Main Street Republican Crowd. We need to quit being a wholly owned subsidiary of the major fund managers on Wall Street and start being more concerned about people out there in places like Iowa. HUCKABEE: I became governor and was able to get things done in the way of tax cuts and transportation, to rebuild roads, some of the most significant education improvements, and some innovative things, frankly, that many people wouldn’t expect out of a Republican, focus on music and art and education, health care innovations that have… You know, I didn’t grow up a child of privilege, and I can relate to a lot of people out there who understand what struggle is like because a lot of Americans every day get up and they don’t face the decision between, are they going to vacation in the Caribbean or the Riviera. They face whether they can squeeze the handle on the gas pump and put enough fuel in the tank to get to work. ROMNEY: I’m very pleased to win, let me tell you. I got a higher percentage even than the president got eight years ago — and, you know what? It was a warm day, and actually it was difficult turning people out. We hoped to get out about 4,000 to 5,000. We did. They came, they voted, I won. Can’t do better than that. That’s exactly what I was hoping for, and frankly the key for me is building that organizational base that propels me. RUSH: Okay. 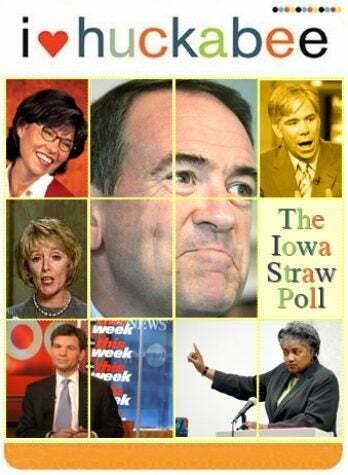 So that’s it, that’s the roster of sound bites we have from the straw poll in Iowa, where you have to pay to get in. The candidates generally pay the voters to show up. Now, I understand whoever comes in second is always … You got an expected front runner. You have Romney was going to win this because none of the other top tier is there. There has to be somebody who comes in second, and the media is looking for a story to sort of get out of their boredom and the humdrums. So whoever would have come in second would have been, ‘Ah, ah, ah, what’s this? Who is this? Where did this guy come from? Hucka — Hucka-whatta? Huckabee from Arkansas. I thought Clinton ran Arkansas. Oh, he’s the new governor. Oh, okay. Good! We’ve got a story,’ and that’s what’s propelling this.